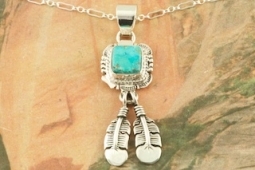 Genuine Easter Blue Turquoise set in Sterling Silver Pendant. Created by Navajo Artist Bennie Ration. Signed by the artist. Free 18" Sterling Silver Chain with purchase of pendant. The Easter Blue mine is located northwest of Tonopah, Nevada a few miles from the Royston district. Turquoise from this claim has also been called Blue Mountain and Blue Gem. It was discovered in 1907 and the first material found was a fine blue color, usually occurring in thin veins, later the mine produced a blue green turquoise with a light to dark brown matrix. Pendant is 2" L including the bale x 5/8" W.